With spring approaching, it is important for parents to keep safety in mind when their children are playing outside. Keeping kids safe while they ride their bikes should be a top priority, according to Jordan Hinds, community programs specialist at Children’s Hospital of Pittsburgh of UPMC. “Bike safety deserves attention because more children ages 5 to 14 are seen in emergency departments for injuries related to biking than any other sport,” he says. Yearly in the United States, bicycle-related injuries cause more than 100 deaths in children under 15, and over 250,000 nonfatal bicycle injuries occur annually. 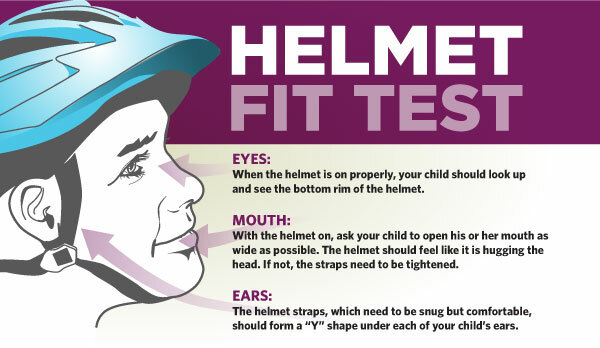 A helmet that fits properly should be worn every time a child rides his or her bike, says Christine Vitale, RN, MSN, injury prevention manager at Children’s Hospital. “Research shows that wearing a helmet reduces the risk of brain injury in a bike accident by almost 90 percent, so we know that wearing a helmet can prevent a severe head injury and potentially save a child’s life,” she says. Make sure reflectors are secured, the brakes and gears function correctly, and the tires are tightly secured and have enough air. Helmets should not be worn on playgrounds, where straps can get caught. Other activities, such as skiing or football, require special helmets. Keep children riding on sidewalks until age 10. Teach older children the traffic laws they need to obey and hand signals they should use when riding on the road. To learn more about bicycle safety, visit the Injury Prevention page for bikes.